Posted on 5, September 2016 by EuropaWire PR Editors | This entry was posted in Belgium, Healthcare, Ireland, Management, Technology and tagged Biomnis, David Norris, digital tracking, medical laboratory testing services, pathology sample traceability, Zetes, ZetesChronos Proof of Delivery solution. Bookmark the permalink. Brussels, Dublin, 05-Sep-2016 — /EuropaWire/ — Biomnis, Ireland’s leading provider of medical laboratory testing services, has implemented the ZetesChronos Proof of Delivery solution to ensure real-time online traceability and offer higher customer satisfaction levels. With ZetesChronos, the company guarantees nationwide safe, secure and high quality transportation of medical samples, with full online traceability. Other benefits include faster and correct invoicing and compliance with UN traceability regulations. Prior to implementing ZetesChronos (internally branded ‘Biotrack’), Biomnis relied on a manual delivery tracking system. This used a unique tracking number that would be manually updated and transferred at every stage in the supply chain. Biomnis has migrated the same basic process onto an electronic format. Using ZetesChronos running on Honeywell CN51 mobile devices, parcels are now scanned at every step in the distribution process. Real-time traceability: customers can check the status of their delivery at any time. Paperless working: more ergonomic for logistics management and administration, leading to fast and correct invoicing. Compliance with UN legislation: The system enables Biomnis to transport infectious substances and consignments containing pathogens, which are classified under UN legislation, with automatic production of transport delivery notes. Registration of overnight storage of samples and exchanges between drivers, each of whom is responsible for a set delivery territory, at specified collection and drop off points. “In a short space of time, ZetesChronos has proved a real winner with clients and we’ve been very impressed with Zetes’ can-do attitude as a technology partner. 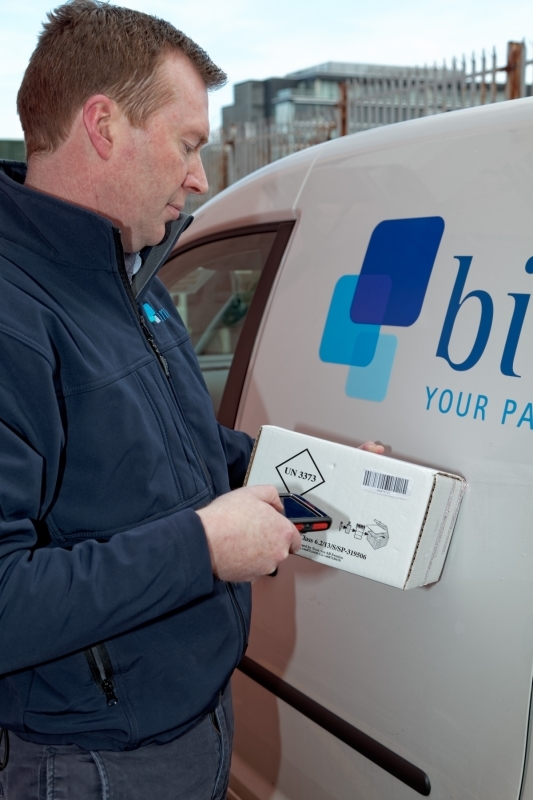 Other providers offered similar solutions but none were as functionally rich and suited to our business”, concludes David Norris, Operations Director at Biomnis.